Fences, directed by Denzel Washington, is an adaptation of August Wilson’s stage play by the same name. It tells the story of Troy Maxson (Denzel Washington) an African-American man living in 1950s Pittsburgh. Peaking as a baseball player just before players like Jackie Robinson broke the Major League Baseball colour barrier, Maxson’s dream of professional sports never happens and he spends his life as a sanitation worker, husband and father. On the surface, Fences focuses on Maxson’s home life with his wife Rose (Viola Davis), their sons Cory (Jovan Adepo) and Lyons (Russell Hornsby), and his relationship with his disabled brother Gabe (Mykelti Williamson) who suffered a brain injury serving in the US Army. The film’s drama comes in the complicating factors. Maxson is a bitter man who masks his bitterness with drinking and selfish behaviour. He provokes his children and he is unfaithful to his wife. He does all of this without repentance, in fact he feels entitled to this way of living because he brings home a paycheque and supports the family financially. As the film unfolds the theme of wrestling with death surfaces. Maxson is building a fence around his house and, while on the surface this is just a necessary part of home ownership, it becomes clear that there is something more going on with the fence. In his heart, he builds the fence to keep out death. This is where the Christian viewer might be reminded of the words of Solomon in the book of Ecclesiastes when he writes, “I considered all that my hands had done and the toil I had expended in doing it, and behold, all was vanity and a striving after wind, and there was nothing to be gained under the sun.” (Ecclesiastes 2:11) Maxson believes himself to be wise (street-wise) yet he is a fool, and what Solomon says of the fool and death easily applies to Maxson, “the wise [man] dies just like the fool! So I hated life, because what is done under the sun was grievous to me, for all is vanity and a striving after wind. I hated all my toil in which I toil under the sun, seeing that I must leave it to the man who will come after me.” (Ecclesiastes 2:16-18) Maxson is antagonistic towards his sons and in particular is envious of his son Cory’s advantages since in the 1950s life for African American men and women had changed compared to that of his own youth. One very interesting moment in the film is a confrontation between Maxson and his wife Rose, when he comes clean about his infidelity. He is not repentant; he is simply telling his wife what has been happening and what his plans are. He only makes this confession because he has impregnated the other woman. In the scene, which takes place in the family kitchen, are two portraits of Jesus. One is hung on the wall behind Maxson and, when the camera cuts to his wife Rose, the other is seen behind her hung over the kitchen sink. Christian viewers may find this a powerful reminder of how Christ Jesus is present in the midst of suffering, how in the most painful of confessions He is there with His forgiveness even when people don’t or won’t avail themselves of this gracious gift. It is a masterful moment where viewers can contemplate the omnipresence of Christ Jesus. With Maxson’s death at the film’s end themes of grief and loss come to the forefront. The interesting thing here is the way people generally deal with the death of someone genuinely unpleasant, abusive, and profoundly selfish. The adage “Never speak ill of the dead” comes into play and suddenly all Maxson’s rough edges are polished off. If viewers have encountered this kind of unpleasant situation and conversation in real life, Fences presents a realistic portrayal. A deeper consideration when watching Fences is the theme of loving the unlovable. St. Peter’s exhortation to the Christian fits well, “Above all, keep loving one another earnestly, since love covers a multitude of sins” (1 Peter 4:8). 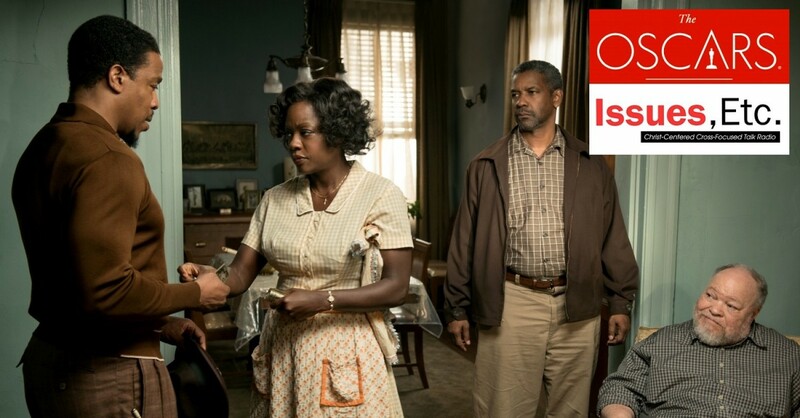 In addition to its nomination in the Best Picture category Fences is also nominated in the Best Actor (Denzel Washington), Supporting Actress (Viola Davis), and Adapted Screenplay (August Wilson) categories.